Most expensive option chosen, and the City would need to find $200 million more to finance the project. Rendering from staff report, p. 4. City Council should pursue the most expensive Gardiner East proposal, according to a recommendation from City staff [PDF]. The staff report going to the Public Works and Infrastructure committee meeting on February 29 lays out three potential routes for the Gardiner realignment east of Jarvis to the DVP. 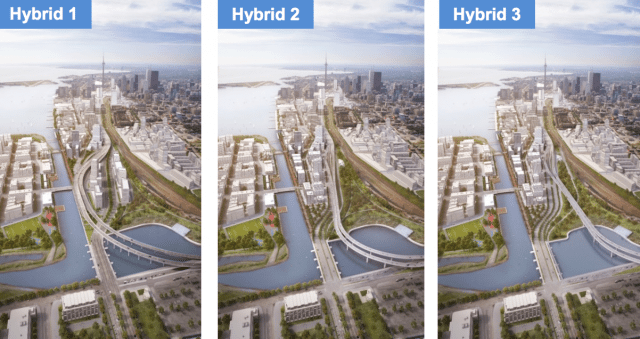 The recommended route, known as Hybrid Option Three, sees the urban expressway alignment go as far north away from the water as it can, and includes a railbridge underpass widening. The project is projected to cost $718 million, excluding upkeep to maintain the East Gardiner over its life cycle. That’s $194 million more than the initial estimate, and the City will have to find extra room in its already-strained capital budget to accommodate the increased price tag. From the staff report, p. 10. 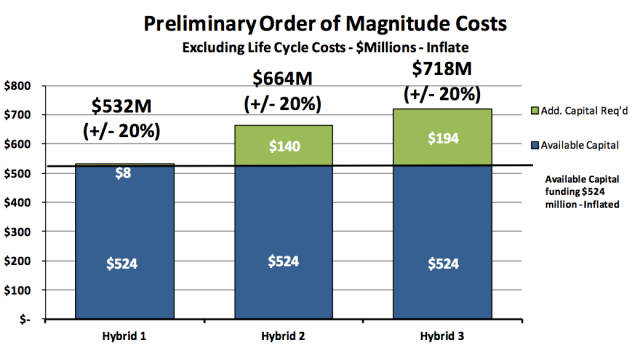 One of the benefits of Hybrid Option Three is how its route maximizes the value of public lands. By choosing an alignment that’s farther north, 7.5 acres of additional real estate gets unlocked for use, an estimated value of $72-83 million. The project would also include $60 million in public realm improvements. The East Gardiner was one of John Tory’s most rancorous debates, won in June 2015 by a narrow vote and against the opposition of every living Toronto Chief City Planner.